The Economic Survey 2017-18, said farmer income losses from climate change could be between 15% and 18% on an average, rising to anywhere between 20%-25% in unirrigated areas of the country. “Applying IPCC (Intergovernmental Panel on Climate Change)-predicted temperatures and projecting India’s recent trends in precipitation, and assuming no policy responses, give rise to estimates for farm income losses of 15% to 18% on average, rising to 20%-25% for unirrigated areas,” pointed out the Survey, adding that at current levels of farm income, that translates into more than Rs. 3,600 per year for the median farm household. “[The] Prime Minister’s goal of doubling farmers’ incomes — increasingly runs up against the contemporary realities of Indian agriculture, and the harsher prospects of its vulnerability to long-term climate change,” pointed out the Survey, adding that India needed to expand irrigation – and do so against a backdrop of rising water scarcity and depleting groundwater resources. “In the 1960s, less than 20% of agriculture was irrigated, now this number is in the mid-40s. The Indo-Gangetic plain, and parts of Gujarat and Madhya Pradesh are well irrigated. But parts of Karnataka, Maharashtra, Madhya Pradesh, Rajasthan, Chhattisgarh and Jharkhand are still extremely vulnerable to climate change on account of not being well irrigated,” said the Survey. In a new paper (Mallory et al., 2018), scientists have again concluded that the Arctic warms in response to a positive Arctic Oscillation (AO) and cools in response to a negative AO, precluding a deterministic role for anthropogenic CO2 emissions. The authors point out that the Canadian Arctic has undergone an overall cooling trend since the late 1990s, or as the AO has pivoted from a positive (1988-1996, warming) to negative (1997-2016) stage. Unfortunately, the recent (1990s-present) cooling trend has not been beneficial for the caribou populations native to this region. Cooler temperatures mean less vegetation is available for foraging, and hence the body condition of the herds deteriorates and broad declines in population intensify. Alternatively, a warming Arctic climate means more food sources are available for caribou herds, leading to better body condition and greater fertility. Bloomberg New Energy Finance (BNEF) lobbies hard for renewable subsidies and estimates global “clean energy” investment at $333 billion. This excludes hydro-electricity other than Politically Correct “small hydro”. Some 85 per cent of expenditure is in wind or solar with the rest including biomass, electric vehicles and waste-to-energy. To recap, in Australia electricity from subsidised renewable energy – and wind is the cheapest of those sources – costs three times as much as energy from coal. It is viable only because the government requires increasing proportions of energy it designates as renewable to be incorporated in our supply and therefore in our bills. This results in a subsidy, which at present is $85 per MWh for wind and large scale solar, and $40 for rooftop solar. Those sums are on top of the market price all energy receives. That market price used to be around $40 per MWh but, as a result of closures caused by subsidised wind forcing increased costs on coal and gas generators, it is now around $90 per MWh; research conducted by the Minerals Council puts new build for coal at under $50 per MWh, costs that are consistent with those estimated for the thousand plus coal generators being built, mainly in Asia. The upshot is a double whammy – we replace low cost highly reliable electricity with supplies that are three times as expensive and which are highly unreliable – and we call that progress!! The $9 billion of subsidy-induced malinvestment in renewables last year alone would have been sufficient to finance over 4,000 MW of new coal plant – more than double the capacity of the now closed Hazelwood station, even if it is in fashionable but high cost low emissions plant. That would have returned prices to their 2015 level, half those now prevailing, and given us the reliability that is now a wistful nostalgia. At present one of the man energy regulators, the AEMC, estimates renewable subsidies increase electricity prices by 10 per cent directly (p.10). That would be increased by another 20 per cent due to the subsidies boosting the overall generation cost and perhaps more due to them requiring increased transmission investment. The lobby industry has taken to interviewing itself to raise the ante for new subsidies. BNEF in response to Reneweconomy notes that the capacity of renewables driven by existing schemes, which focus on the Paris Agreement’s 26-28 per cent reduction in emissions by 2030, will soon be met. Hence they are calling for further expansion of subsidies (existing ones, unless terminated, will live on for decades). BNEF argues “So what’s required is a more ambitious emissions reduction target under the National Energy Guarantee (NEG), or for state governments to continue to develop policy to ramp up investment.” And the hope of the industry is that Mr Turnbull will exercise his influence and “States should be throwing their weight around the COAG table and only signing up to a NEG if it ups ambition on a pathway to net zero emissions by 2050”. The industry also claims renewable energy is already competitive, pointing to recent contracts struck by AGL and Origin Energy for renewable power at around $60 per MWh. But public information of these contracts’ details is missing, including about what happens to the subsidy (which on forward markets remains above $50 per MWh). It is difficult to square claims made by many lobbyists on the back of such contracts that renewables are now competitive with coal especially since the same lobbyists say investment will dry up without more subsidies. Meanwhile we have politicians swallowing the propaganda of the renewable industry or too timid or committed to renewable energy to stand up and tell it as it is. Only a couple of minor players in Europe and the great Donald are resisting the madness. The USA is benefitting immensely from Trump’s energy policies with waves of new investment – including from Australia – announced almost weekly. In time the success of Trump’s policies will surely remove the blinkers from the eyes of politicians but in the interim we can expect to lose considerable wealth, energy-dependent investment and face trying times in the reliability of the electricity supply system. A new study published in the prestigious journal Nature finds that all those global warming doomsday scenarios aren't credible. Not that you would ever know based on how little coverage this study is getting. The study, published on Thursday, finds that if CO2 in the atmosphere doubled, global temperatures would climb at most by 3.4 degrees Celsius. That's far below what the UN has been saying for decades, namely that temperatures would rise as much as 4.5 degrees, and possibly up to 6 degrees. Of course this is just one study, but it supports the contention climate skeptics have been making for years — that the computer models used to predict future warming were exaggerating the impact of CO2, evidenced in part by the fact that the planet hasn't been warming as much as those models say it should. Why is this important? Because all those horror stories told over the past decades are based on predictions of temperature increases that are much higher than 3.4 degrees. A 2008 National Geographic series, to cite just one example, contended that scientists are warning that the global average temperature could increase by as much as 6 degrees Celsius over the next century, "which would cause our world to change radically." Oceans, it said, would become marine wastelands, deserts would expand, catastrophic events would be more common. The Obama administration's EPA put out a report in 2015 claiming that climate change would triple the number of extremely hot days in the U.S. by 2100, increase air and water pollution, cause $5 trillion in damages for coastal property, and result in tens of thousands of premature deaths. The EPA assumed a global temperature increase of 5 degrees. The Nature study blows a hole in these and other doomsday scenarios that have been peddled for decades by everyone from Al Gore to Prince Charles. In other words, it's big news. And don't be surprised if scientists end up revising peak warming down even further. That's been the trend up until now, after all. Back in 1977, the National Academy of Sciences said temperatures would shoot up 6 degrees C by 2050 because of CO2 emissions. In 1985, James Hansen claimed that doubling CO2 levels would boost temperatures up to 5 degrees, and other computer models at the time put the upper bound at 5.5 degrees. As it happens, though, on the same day the Nature study was published, NASA released its latest report on global temperatures, declaring that 2017 was the second hottest year on record, with 2016 the hottest. Guess which story made front page news? The New York Times put the NASA story on its main webpage, and ignored the Nature study entirely. Even if it's true that 17 of the 18 hottest years have occurred since 2001 — which requires one to assume the government's manipulation of past temperature data has been on the up and up — the relevant question isn't what's happening now, but what is likely to happen going forward. If the scientific evidence is showing that the harm from CO2 emissions will be far less than feared, we should be celebrating. Surely all those "settled science" folks would agree. Immediately, the issue appears of how representative are the samples of 24 localities and 66 tide-gage records? There are hundreds of tidegage records giving dramatically different results. For example, the Gulf of Bothnia, and in Scandinavia tidal gages show sea levels are falling, due to rebound of the land from last Ice Age, called post-glacial rebound or isostatic rebound. Other areas, such as tidewater Virginia, tidal gages show sea levels are rising due to land subsidence, primarily from groundwater extraction. Gages at The Battery, show Manhattan may be subsiding, from heavy buildings built on bedrock. In the Kopp study, the long-term proxy data and the tide-gage data are dominated by the East Coast of the US and by Western Europe, with no proxy data from Scandinavia. The sample appears not to be representative of the coast lines of the world, thus may be of little value. An obligation of research proposing samples are representative is to remove every possible source of bias, not to introduce bias. A second major issue is the use of semi-empirical models, which Willem de Lange and Robert Carter found to be the most alarmist of all the techniques they reviewed in their study of global sea-level change. In general, these modeling techniques do not explicitly state assumptions, that can be challenged or substantiated by observations. They tend to be built more upon assumptions supporting assumptions, which has little value in understanding the physical world. A third major issue is excessive precision in estimates of 20th century sea level rise. Adding speculative probability statements only adds doubt to the skeptic. In sum, the conclusion of the Kopp study that 20th century sea level rise was extremely likely faster than during any of the 27 previous centuries is not substantiated, although there is little doubt that sea levels are higher than they have been since the last interglacial period, the Eemian, about 115,000 to 130,000 years ago. Scientific knowledge is always provisional. The point is to produce evidence, not doctrine. Skepticism is the lifeblood of scientific progress. By constantly asking whether there is a different answer, a better approach or an alternative view, scientists drive improvements and innovations that ultimately benefit everyone. It is not “antiscience” to be skeptical—it’s definitively pro-science. At a time when people of all ideological stripes are seeking definitive sources of truth, we should all embrace our inner skeptics and turn to the scientific method for a fresh approach to resolve our differences. When I started out as an oncologist in the mid-1980s, women with the most aggressive form of breast cancer were subjected to surgical removal of not only their breasts but large amounts of their chests and rib cages. Treatment later evolved toward less-extensive surgery but greater use of chemotherapy, which too often came with debilitating side effects. I still remember what I called “the mother sign”—women being helped into my clinic by their moms because they were so weak from the therapies I gave them. In the 1990s I left patient care for biotechnology, which held promise in improving cancer treatments. I led product development at Genentech, where we developed drugs such as Herceptin, which targeted cancerous cells and left healthy ones largely intact. By challenging the status quo, we found ways to treat at least some patients without first making them sicker. In a little over a decade, cancer treatment moved from disfiguring surgery to powerful drugs to precise gene therapies. Today, harnessing the immune system to treat cancer shows immense promise for the next advance. 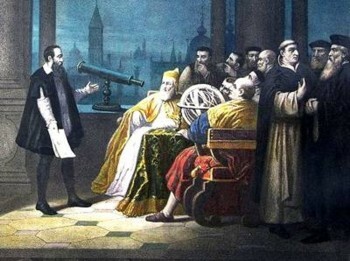 But whereas skepticism and uncertainty have always been the heart and soul of science, confidence and certainty are the coin of the realm in much of today’s public discourse. Unquestioning confidence is deeply troubling for the scientific community because it is not the currency we trade in, and it has led people in America and around the world to question scientific enterprise itself. We should all be troubled when science is treated as if it were an ideology rather than a discipline. Valuing beliefs over science manifests itself as cynicism at best, denialism at worst. Scientists talk about skepticism to assert that nothing should be accepted or rejected without considerable evidence. Denialism—the refusal to accept established facts—is different and dangerous. According to Harvard research, between 2000 and 2005 AIDS denialism in South Africa led to an estimated 330,000 deaths because the government rejected offers of free drugs and grants and dragged its heels on establishing a treatment program. And in just eight weeks last year—April 7 to June 2—Minnesota saw more cases of measles, a disease easily prevented with a vaccine, than had occurred in the entire United States in 2016. The point of science is not to produce doctrine, but to collect and test evidence that points toward conclusions, which in turn inform approaches, treatments and policies based on rigorous research. These conclusions are provisional. Scientific investigation is undertaken to question today’s knowledge, to seek new evidence through research and experimentation. That is not to say that previous evidence was “false,” merely that it was less complete. Those surgeons who performed radical mastectomies in the 1980s were acting with the best knowledge available at that time. As the understanding improved, so did the methods. Nor is it to say that current knowledge shouldn’t be trusted—there is strong evidence that vaccines save lives, for example, and scant evidence that they cause harm. When I was a practicing oncologist, one way I built trust with patients was to be open and honest about what I knew for certain and what I didn’t. On my best days, I didn’t just talk; I listened. I answered patients’ questions to the best of my knowledge and did follow-up research on the ones I couldn’t answer. If I witnessed an outcome I didn’t expect, I revisited my assumptions. That’s how I applied the scientific method in the wild. I follow a similar approach in my current job. The Bill & Melinda Gates Foundation uses a data-driven, evidence-based decision-making model. When the evidence changes, so does our strategy—as it did with malaria. Once it was clear that controlling the disease world-wide was practically and politically unsustainable, we increased our focus on accelerating elimination in regions where it is feasible now. At the same time, we’re continuing to support efforts to save lives and develop the tools that will eventually allow us to eradicate the disease. What is undeniable is that the scientific breakthroughs in which we invest, such as new vaccines and hardier crops, help people around the world survive and thrive. How many more people benefit—and how quickly—will depend in part on public confidence in science. We can rebuild that confidence by uniting around the qualities of the scientific method. As the name suggests, the scientific method is not a belief system, it is a practice. We would all benefit from more practice. In North-East Greenland, researchers have measured the loss of heat that comes up from the interior of the Earth. This enormous area is a geothermal “hot spot” that melts the ice sheet from below and triggers the sliding of glaciers towards the sea. Today, in the esteemed journal ‘Scientific Reports’, researchers from the Arctic Research Centre, Aarhus University, and the Greenland Institute of Natural Resources present results that, for the first time, show that the deep bottom water of the north-eastern Greenland fjords is being warmed up by heat gradually lost from the Earth's interior. And the researchers point out that this heat loss triggers the sliding of glaciers from the ice sheet towards the sea. “North-East Greenland has several hot springs where the water becomes up to 60 degrees warm and, like Iceland, the area has abundant underground geothermal activity,” explains Professor Søren Rysgaard, who headed the investigations. It is not easy to measure the geothermal heat flux – heat emanating from the Earth’s interior – below a glacier, but within the area there are several large glaciers connected directly to the ice sheet. If the Earth releases heat to a fjord, heat also seeps up to the bottom part of the glaciers. This means that the glaciers melt from below and thus slide more easily over the terrain on which they sit when moving to the sea. “It is a combination of higher temperatures in the air and the sea, precipitation from above, local dynamics of the ice sheet and heat loss from the Earth's interior that determines the mass loss from the Greenland ice sheet,” explains Søren Rysgaard. “There is no doubt that the heat from the Earth’s interior affects the movement of the ice, and we expect that a similar heat seepage takes place below a major part of the ice cap in the north-eastern corner of Greenland,” says Søren Rysgaard. Do our politicians realize that wind and solar are intermittent power sources? Something I have wondered for a long time: do the politicians who want to go for 100% wind & solar realize that these power sources are intermittent and therefor balancing and/or storage is needed in the transition? When I look at the competencies of the Minister of Energy, his crew and the energy experts among the politicians, then I fear for the worse. The need for balancing/storage is completely absent in the discussion. We only hear that we need more wind and solar in our energy mix, but never about measures to overcome intermittency. This shows that he at least realizes that wind & solar are intermittent and therefor storage is important in a continuous working system. However, it also shows that he currently has no clue how to solve the issue of intermittency, he just “believes in innovation” and “counts on enterprises” to “find solutions”. They are making it up as they go along, hoping that a solution for the intermittency will be found in the future. This is in stark contrast with other power sources that don’t have the same privilege. For example, new developments in nuclear power are not even considered and basically ignored or dismissed. They are probably silent about this because it could demotivate the public, knowing that the construction of wind mills and solar panels is not the end of the investments, but only the beginning. Do they plan to present the public (the voters) with a fait accompli? Not sure whether they realize the extent of the problem, more specific seasonal variation and the risk of having an insignificant supply of both solar and wind energy in winter at peak consumption. That is not really clear, not only because it is not mentioned in their communications, but also since they seem to gamble on future innovation of the private sector to solve the issues. Then when the cold era returns, ice sheets grow, sea levels fall, and the warm era coral reefs (like the Great Barrier Reef) get stranded on the new beaches and coastal plains. Usually the process is slow enough to allow the coral polyps to float into deeper warmer water closer to the equator and build another reef. Greenies have been pumping out studies like this for decades. Car exhaust has got to be bad for you! It's got those evil microparticles in it. It does. But are they harmful and at what concentration are they harmful? The study below does not allow those basic questions to be answered. It did not in fact measure anybody's exposure to the particles. The researchers just looked at where people lived during their childhood. And if that area had a lot of pollution they theorized that people brought up there should have bad health. And they found it was so. But correlation is not causation and they failed to look at WHY some people lived in more polluted areas. But we know why. Because they were poor. Leafy areas are for rich people. The poor live where they can afford it, beside major roads, industrial areas etc. So what we are most likely seeing here is that it is the poor who have worse health, which has been known for years. If the researchers had controlled for income they might have had a story but there seems to be no indication that they did. And the effects they observed were tiny anyway, making it highly likely that any control would wipe them out. Exposure to total suspended particulate (TSP), which are particles circulating in the air that measure 0.05mm, during girls' teenage years also makes their menstrual cycles less regular, a trial found. TSP, which is largely made up of vehicle exhaust and coal combustion fumes, is thought to disrupt hormone production in people's bodies. Previous research suggests this causes birth defects as a result of women suffering inflammation and 'internal stress'. The researchers analyzed 34,832 women aged between 25 and 42 who were enrolled in the 1989 Nurses' Health Study 2. They investigated the TSP levels in the air surrounding the study's participants' homes they lived in during high school. This information was obtained from the US Environmental Protection Agency. The women were asked how old they were when they started their period and how long it took for their cycles to become regular. Results further reveal that for every 45 μg/m3 increase in TSP exposure during high school, girls have an eight percent higher risk of suffering moderate or persistent irregularity. The researchers defined moderate irregularity as periods that were always erratic during high school or between the ages of 18 and 22. Persistent irregularity is an inconsistent menstrual cycle both at high school and the ages 18-to-22. The findings also show that for every 45 μg/m3 rise in TSP exposure, a girl's risk of producing excessive male hormones increases by up to 11 percent. What is the association between perimenarchal exposure to total suspended particulate (TSP) in air, menstrual irregularity phenotypes and time to menstrual cycle regularity? Exposures to TSP during high school are associated with slightly increased odds of menstrual irregularity and longer time to regularity in high school and early adulthood. The menstrual cycle is responsive to hormonal regulation. Particulate matter air pollution has demonstrated hormonal activity. However, it is not known if air pollution is associated with menstrual cycle regularity. Cross sectional study of 34 832 of the original 116 430 women (29.91%) enrolled in 1989 from the Nurses’ Health Study II (NHSII). The follow-up rate for this analytic sample was 97.76% at the 1991 survey. Annual averages of TSP were available for each year of high school attendance. We created three case definitions including high school menstrual irregularity and androgen excess. The time to menstrual cycle regularity was reported by participants as <1 year, 1–2 years, 3–4 years, 5 years or longer, or never on the baseline questionnaire. Odds ratios and 95% confidence intervals (CI) were calculated for 45 μg/m3 increases in TSP exposure, adjusted for risk factors for menstrual irregularity. In multivariable adjusted models, we observed that for every 45 μg/m3 increase in average high school TSP there was an increased odds (95%CI) of 1.08 (1.03–1.14), 1.08 (1.02–1.15) and 1.10 (0.98–1.25) for moderate, persistent, and persistent with androgen excess irregularity phenotypes, respectively. TSP was also associated with a longer time to cycle regularity, with stronger results among women with older ages at menarche and those living in the Northeast or the West. The outcomes of menstrual regularity and time to cycle regularity were retrospectively assessed outcomes and may be susceptible to recall bias. There is also the potential for selection bias, as women had to live until 2011 to provide addresses. Temporal exposure to air pollution in the adolescent and early adulthood window may be especially important, given its association with phenotypes of menstrual irregularity. The data from this study agrees with existing literature regarding air pollution and reproductive tract diseases. The White House has drafted a proposal to scale back environmental rules in an effort to make it easier to construct roads, bridges, and pipelines across the country, as part of an infrastructure plan that President Trump could release as soon as next week. The plan would change things such as how officials decide a pipeline route, how a proposed border wall with Mexico would be built, and whether the National Park Service could object to a development that would impair tourists’ views from scenic parks such as the Grand Canyon, according to a document obtained by The Washington Post. Administration officials say they are willing to alter elements of the legislative package to win enough votes for Senate passage. Scientists at the University of Manchester say they've found a surprising global warming culprit: sandwiches. Can the simple act of eating a sandwich really be bad for the environment? New research by British scientists suggests a shocking response: Depends on the sandwich. Researchers at the University of Manchester Thursday announced the results of what they claim to be "the first ever study looking at the carbon footprint of sandwiches, both home-made and pre-packaged." Perhaps not surprisingly, the results are bad news for meat-eaters. The study found that sandwiches containing pork meat (that's bacon, ham and sausage), cheese and prawns contained the highest carbon footprints. The worst of the lot, the so-called "all-day breakfast" sandwich containing egg, bacon and sausage, created the same carbon dioxide emissions as driving a car 12 miles. The study took into account the environmental impact of raising various sandwich ingredients, processing them, transporting them, packaging them and refrigerating them before purchase and consumption. In their conclusion, the researchers recommend reducing the amount of cheese and meat in sandwiches, extending sell-by and use-by dates, and making sandwiches at home if at all possible. The sandwich is something of a U.K. specialty. John Montagu, the 4th Earl of Sandwich, is believed to have invented the delicacy sometime in the 1700s for those occasions when he was unable to fit a meal into his busy work schedule (or gambling schedule, depending on what source you believe). According to the British Sandwich Association (yes, there is such a thing and they even have a magazine), more than 11.5 sandwiches are consumed each year in the U.K. alone. Pretty rubbishy stuff below. They admit that the dry lakes were caused by people taking water from rivers for irrigation etc. but still say -- with no evidence whatever -- that global warming contributed to the loss. It might also be mentioned that Africa generally has been hard hit by drought recently -- but that was an effect of ElNino, not CO2. El Nino is winding down more slowly than expected but when it does the rain will return. They were once great bodies of water containing an abundance of wildlife and an important resource for humans. But a growing number of lakes, some that were once thriving destinations for tourists, are drying up faster than ever - and in the majority of cases the blame lies with water mismanagement and climate change, according to an ecology expert. Shocking satellite pictures show how lakes such as the Aral Sea in Uzbekistan and Lake Urmia in Iran are getting smaller and smaller by the year. In the case of the Aral Sea, it started drying up in the 1960s as water was taken away from the lake to irrigate the crops in the dried land of what was the USSR. And the impact of that means the lake now only stands at 10 per cent of its former surface area of 26,300 square miles - and has decreased by an estimated 167 billion gallons of water. A similar situation has arisen with Lake Urmia, which was once a luxury holiday destination, but has started to shrink due to dams on the rivers feeding it. Today, it has lost 40 per cent of its previous area of 2,000 square miles. Another tourist destination under threat is the Dead Sea in the Middle East, which is also shrinking at an alarming rate due to water mismanagement. Water levels have been dropping by up to three feet per year, and Israel, Jordan and Palestine have agreed to a plan to pump in about 53 billion gallons of water a year from the Red Sea to boost levels. Meanwhile the demand for water in the US states of California and Nevada has been blamed for Owen's Lake reducing significantly since 1926. This is because the Los Angeles Department of Water and Power diverted the Owens River into the LA Aqueduct instead of the lake. Now, over 90 years on, city officials are spending $1.2 billion to try and stop the lake from becoming a complete dust bowl. Lake Faguibine in Mali, shockingly, has been almost completely dry since 1990 following a prolonged drought. It had previously stood at 230 square miles but has almost completely disappeared. According to lakes expert Lisa Borre, who is a researcher at the Cary Institute in Millbrook, New York, human intervention is the main reason these landmarks are disappearing. She told MailOnline Travel: 'Extensive research on the worst of these disasters, including well documented examples such as the Aral Sea and Lake Urmia, show that the main culprit is diverting water or other mismanagement in the watershed that prevents enough water from reaching the lake. 'That said, the situation on every lake is unique and requires understanding of its natural setting and climate as well as what is happening to the source of water feeding the lake and the amount of water leaving the lake through natural and human causes. 'Climate change can exacerbate problems caused by mismanagement of water resources. With few exceptions, lakes across the globe are warming. Lake Assal in Djibouti is also evaporating at an alarming rate due to drought as temperatures in the African country can often reach over 50 degrees celsius, which could be a result of global warming. The lake also sees very little rainfall feed it and is one of the few bodies of water that is shrinking for reasons other than human intervention. And even though the loss of a lake may not seem like a problem for most people, Ms Borre says we should all be concerned. She added: 'The loss of any lake is a concern because lakes provide important ecosystem services. 'In the most extreme cases, the toxic dust blowing off dried lake beds can create human health problems. 'Less freshwater in the lake creates higher salinity, making the water inhospitable to the fish, wildlife and humans that depend on the lake for water and food. 'Many of the most threatened lakes in the world are also important for biodiversity conservation and support migratory birds and diverse fisheries. It is very cold here in the Eastern US and the President is joking about the lack of global warming. More interesting by far is the fact that there appears to have been no CO2 induced warming in the last 40 years, which is as far back as the satellite measurements go. That this incredible fact has gone unnoticed is due mostly to the scientific community’s fixation on the warming shown by the surface temperature statistical models. But as explained here, these complex computer models are completely unreliable. Also, the satellite measurements do show some global warming, which people have mistakenly assumed somehow supports the hypothesis of human caused, CO2 induced warming. Careful inspection shows that this assumption is false. 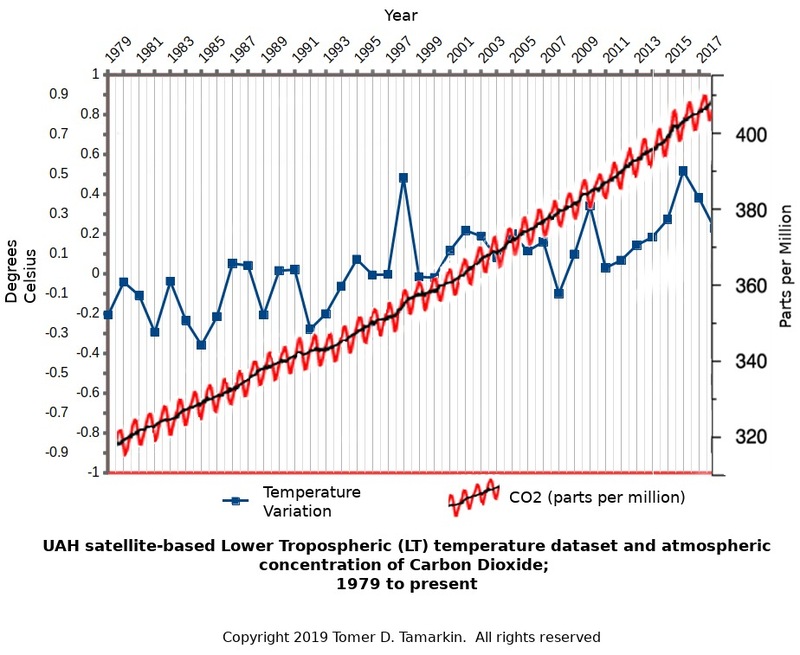 There is in fact no evidence of CO2 warming in the entire satellite record. To see this one must look at the satellite record in detail. To understand this, bear in mind that science is all about the specific details of an observation. These details can overthrow grand theories that are widely accepted. For example, the negative result of the Michelson-Morley experiment led to the revolutionary special theory of relativity. When it comes to global warming, the 40 year satellite measurements provide a strong negative result for the CO2 warming hypothesis. The CO2 warming just is not there. To see this negative result, let us look closely at this graphic. It gives the monthly almost-global temperature readings for the lower atmosphere. The satellites do not cover the entire globe, just most of it. There is also a red line showing a 13-month running average temperature. Note that on the vertical scale the temperatures are shown as what are called anomalies, not as actual temperatures. An anomaly here is the difference in degrees Celsius between the actual temperature and an arbitrarily chosen average temperature. That average temperature defines the zero line in the graph. Why this is done is not important for our discussion. To begin with look at the period from the beginning to 1997. The red line shows that this is what is called an aperiodic oscillator. It is an oscillator because it consistently goes up and down, up and down, etc. It is aperiodic, as opposed to periodic, because the ups and downs are somewhat irregular. It should be clear by inspection that there is very little, if any, overall warming during this period. That is, the red line is oscillating around roughly the -0.1 degree line. When you have an aperiodic oscillator with this few oscillations there is no point in trying to be extremely precise, because the next oscillation might change things a bit. In particular, one must be very careful in doing straight line (that is, linear) trend analysis, because the result will be very sensitive to where you start and stop the trend. So let’s just say that there is little or no warming during this period. This was well known at the time and it was a major issue in the climate change debate. Then comes what is often called the giant El Nino, although it is actually a giant El Nino-La Nina cycle in ocean circulation. First the temperatures go way up, then way down, before stabilizing back into a natural aperiodic oscillator. Thus the graph looks to have basically four distinct periods. First the little-to-no warming period from 1979 until 1997. Second the giant El Nino-La Nina cycle from 1997 until 2001. Third, the warmer little-to-no warming period from 2001 to 2015. Fourth the new El Nino-La Nina cycle that is still in progress. Yes there is some warming but it appears to be almost entirely coincident with the giant El Nino-La Nina cycle. 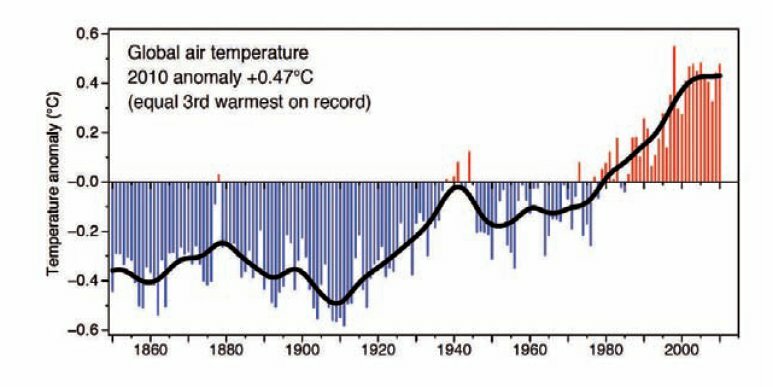 The simplest explanation is that the second flat aperiodic period is warmer than the first because of the El Nino effect. Perhaps some heat was injected into the atmosphere that remained, thereby increasing the baseline for the next aperiodic oscillator. But in no case is there any evidence of CO2 induced warming here, nor of any human-caused warming for that matter. These causes would produce a relatively steady warming over time, not the single episodic warming that we clearly see here. In particular, to my knowledge there is no known way that the gradual CO2 increase could have caused this giant El Nino-La Nina cycle. Thus the little warming that there is in the last 40 years appears to be more or less entirely natural. In any normal science this result would be sufficient to invalidate the hypothesis that the increasing CO2 concentration is causing global warming. There’s a headline I bet you didn’t see coming, huh? We’re living in a time when the American energy sector is surging and becoming a dominant force not only domestically, but globally as well. There’s a president in the White House who is loosening up restrictions on drilling as we speak. Older pipeline projects are finally being finished and newer ones are kicking into gear. That includes Pennsylvania where, as we recently discussed, the Mariner East II Pipeline may soon be bringing even more product into the Philadelphia/New York region for processing and shipment. So with all of those conditions in place, how in the world could the Philadelphia Energy Solutions LLC refinery, one of the biggest around, be filing for bankruptcy? That must be a mistake, right? But it’s not. Philadelphia Energy Solutions LLC, owner of the largest oil refinery serving the New York Harbor gasoline and diesel market, filed for Chapter 11 bankruptcy protection. The company, a joint-venture between The Carlyle Group LP and a subsidiary of Energy Transfer Partners LP, filed a petition Sunday in U.S. Bankruptcy Court in Delaware. Chief Executive Greg Gatta said in a memo obtained by Bloomberg News that the company had a prepackaged reorganization plan and cited the more than $800 million it paid since 2012 to comply with the U.S. government’s Renewable Fuel Standard as a key factor for the decision. The company’s debt is between $1 billion and $10 billion, it said in its filing, without providing further details in its initial petition. How did that happen with energy products being so plentiful? The easy answer is provided by the company which owns the refinery. It’s not one of the newest designs so they’re not equipped to process biofuels and blend them into gasoline. And because of our old friend the Renewable Fuel Standard, that means that the refinery has to purchase government mandated RIN credits (Renewable Identification Number) in order to legally operate. In case you’re wondering how much those RIN credits cost these days on the bizarre market which has grown out of the government mandate, Philadelphia Energy Solutions had to spend $217M in 2017 for them. That was their second highest operating cost, adding up to more than any other expense besides crude oil to process, and more than twice their total salary for the workforce. At the same time, as I mentioned above, an abundant oil supply is something of a double edged sword. High supply and steady demand means lower prices, so the government was jacking up their costs massively just as profits were getting slimmer. Was there anything that could have been done? Of course. We were first saddled with this program by George W. Bush, much to our dismay. Then it really kicked into high gear under Barack Obama. But there was always hope that perhaps Donald Trump could help. Yes, he had sworn fealty to King Corn in Iowa when he was on the campaign trail, but at least some relief could have been offered. But when the EPA quietly floated a trial balloon about possibly scaling back the RFS standards a bit, Trump shot the idea down. More recently, several state governors, including Pennsylvania’s, pleaded with the President to grant waivers to some of the hardest hit states. Once again, Trump denied the request. And now Philadelphia Energy Solutions has entered Chapter 11. Bush started this. Barack Obama made it worse. But Donald Trump had multiple chances to do something about it and he has refused. This one lands on his plate as far as I’m concerned. A scooter, a polaroid camera, a drone and pink LED lights are some of the purchased items that have Queensland's chief scientist in hot water. Suzanne Miller faced court on Wednesday over allegations she used a state government-funded credit card to buy the random items as well as a high-pressure cleaner, Go-Pro camera and industrial fan. Miller, currently stood down from her position, appeared in Brisbane Magistrates Court to face 31 new counts of fraud. The Crime and Corruption Commission slapped the 52-year-old, who was first charged last July over a $45,000 private health insurance claim, with the extra 31 offences in December. It alleges Miller, who was also the chief executive of the Queensland Museum, used a corporate credit card to buy more than $30,000 worth of items for her own use between September 2013 and July 2017. Court documents show the items, including the cameras, scooter, drone, high-pressure cleaner, pink LED lights, and fan. Miller was stood aside on full pay in 2017 after she was charged with the separate fraud offence in July. The state's corruption watchdog alleges she dishonestly gained private health insurance worth $45,000 as an employee of the Queensland Museum between February 2014 and July 2017. The Scottish-born professor was also charged with one count of uttering a forged document in March 2015, namely an immigration letter. Miller, who made no comment as she left court on Wednesday, had her bail continued and matters adjourned until February 19. 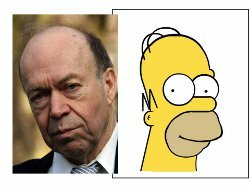 James Hansen, one of the key originators of climate change alarmism, is back in the news. This time it is with a prediction that we may see a ten year “hiatus” in global warming. He says that alarmism is not affected. I agree with his prediction but not with his conclusion. In my view alarmism is being falsified right before our eyes. The big difference between us lies in whose temperature record this hiatus occurs. Hansen sees it as a pause in long-term human caused warming. But I see it as a continuation of almost no warming, and what little there is, is natural. This is a bit complicated, but here goes. This computer model shows more or less steady global warming for the last 40 years or so. This supposed warming is the primary basis for climate change alarmism. GISTEMP has some well known problems, especially the fact that it has been repeatedly adjusted to increase the long-term warming. This in itself is a science scandal, but I think the problems with these statistical models go much deeper. I argue in my article “Fake Temperatures” that all of these statistical surface models are worthless. 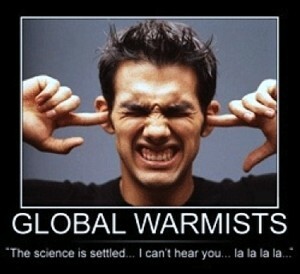 Their purported global warming is actually just what is called an artifact of the model, not something real. My basis for writing off these computer models is that the satellites, which actually measure temperatures, show no such global warming. In real science observations trump computer models. What the satellites show is explained in my article “No CO2 warming for 40 years?” Simply put the record looks like this. First there is no warming from the beginning in 1978 until 1997, a period of roughly 20 years. Then there is what is called a Super El Nino cycle, which takes several years. After that there is again a long period of no warming. Finally there is the recent Super El Nino, the cycle of which is still in progress. However, the second long period of no warming is warmer than the first. Thus there is indeed some global warming in this record, but it looks to be caused by the Super El Nino cycle. There is no evidence of human cause in this small warming and it is the only warming in the record. This leads to the question: what will happen after the present Super El Nino cycle ends? What is obviously most likely is that we will see another long period of no warming. This period may well be a bit warmer than the last period, just as that period was a bit warmer than its predecessor. So in this limited respect I agree with Hansen, which is something I never expected to happen! But while he sees a coming hiatus as just a minor glitch for climate change alarmism, I see it as another big nail in the coffin. There simply is no evidence of human caused global warming in the entire satellite record. What small warming there is looks to be entirely natural, a bit of heat left over from a Super El Nino cycle. If this pattern continues for another ten years it will surely mean that the hypothesis of dangerous human caused global warming is finally falsified by real world observation. A face appears eerily from beneath the ground at the site of an ancient port that once hustled and bustled supplying goods to the rulers of Rome. The well-preserved statue is one of many stunning artefacts uncovered by British archaeologists, who have unearthed a major amphitheatre at Portus, close to Fiumicino airport. The ancient gateway to the Mediterranean was twice the size of the port of Southampton and supplied the centre of the Roman Empire with food, slaves, wild animals, luxury goods and building materials for hundreds of years. It is now two miles inland. The excavation team conducted the first ever large-scale dig at Portus, which has been described by experts as one of the major archaeological sites in the world. Today it sits incongruously next to the airport runway and the team digs to the sound of jet engines. The project concentrated on the banks of a hexagonal-shaped man-made lake which formed part of the 2nd century harbour, about 20 miles from the Italian capital, and found the amphitheatre inside a gigantic imperial-style palace. It could have held up to 2,000 people and is similar in size to the Pantheon in Rome. Portus project director Professor Simon Keay said he thought the material used to build the amphitheatre means it could have played host to the famous Roman emperors in the 2nd century. Prof Keay said: 'This amphitheatre is, in fact, tucked away. It's at the eastern end of the palace and it's a very intimate building and you would not even know it was there unless you approached from the east. 'Its design, using luxurious materials and substantial colonnades, suggests it was used by a high status official, possibly even the emperor himself, and the activities that took place there were strictly private: it could have been games or gladiatorial combat, wild beast baiting or the staging of mock sea battles, but we really do not know. Portus was close to the ancient river port of Rome Ostia and was certainly very important and vital to the survival of the Roman Empire and so would have been of interest to the emperors, who would have used it to travel to and from the city. The team has found a 295ft-wide canal that linked two huge basins where ships weighing up to 350 tonnes unloaded their cargo to Ostia. Cargo could then use the Tiber to travel to Rome. Prof Keay said the dig is very important and has also uncovered thousands of smaller finds. 'It's going to generate a lot of rethinking about how ports were used and that will change the way we think about Rome's relationship with the Mediterranean,' he said. 'The site has been known about since the 16th century but it has never ever been given the importance it deserves. It has been grossly understudied. This is one of the most important archaeological sites in the world. How credible are these worries? The end of the world itself is a given, but is so far off as not to be worth fretting about. However, the end of the world as we know it – aka Western civilisation – is a different matter. There is an emerging strand of respectable scientific thought that says its decline and fall has started already, or soon will (see “End of days: Is Western civilisation on the brink of collapse?“). What are we to make of such claims? There seems little reason to doubt that Western civilisation will eventually collapse. Unless it is immune – by accident rather than design – to the forces of history, it will go the way of all civilisations. Recent political events and long-term environmental trends offer little comfort; artificial intelligence and synthetic biology add a more urgent threat. But extraordinary claims require extraordinary evidence, and as yet the warnings of impending collapse don’t add up to a compelling reason to stock up on bottled water and canned food. Nonetheless, we ought to give them a fair hearing. Unlike earlier civilisations, we have ways to identify subtle trends and the means to intervene. But those making the case for action need to be canny. There is already ample scientific evidence of one real but avoidable threat to civilisation. And yet our efforts to avert it verge on the pitiful. That threat, of course, is climate change. One of the reasons we’re struggling to deal with it is that some activists saw it as a golden opportunity to further their political agenda: reining in corporations, regulating free markets and imposing environmental legislation. For them, climate change was less of an inconvenient truth than a convenient one. The risk is that this new and important science is turned into yet another culture war. Before proposing divisive solutions, scientific eschatologists need to concentrate on nailing the basic facts. Otherwise, historians of the future may judge us harshly for reading the danger signs but failing to act. On 1 December last, South Australian Premier Jay Weatherill flipped the on switch for the giant lithium-ion battery at Jamestown and this facility went online. It was a huge celebration all round for the South Australian Government which is facing what promises to be a very difficult election and the US company Tesla which constructed and installed the battery – well, actually, lots of smaller batteries – known as the Hornsdale Power Reserve. The Reserve is designed to store 129 megawatt hours of power for use at times of acute shortage and is supposed to provide 30,000 South Australian homes power for more than an hour in the event of a failure. For the record, the 2016 Census reported that South Australia had 767,267 dwellings. Even the battery facility’s loudest champions can’t escape the unfortunate fact that a very small number of homes could only be supplied for a very short time if the facility was working at peak efficiency. Premier Weatherill must be hoping that these lucky 30,000 homes are strategically scattered among Labor’s marginal seats. 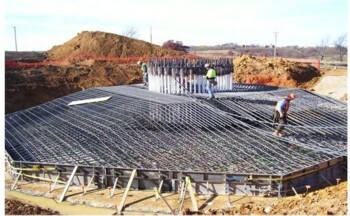 The facility is linked to a wind farm owned and operated by French firm Neoen. Power produced there is sent to the battery facility and stored for future use. Australia generally and South Australia in particular have been treated to a masterful public relations blitz by Tesla’s US boss Elon Musk who has long shown a remarkable ability to con money from governments and the public when both have been dazzled by his non-stop self promotion. Typical of his behaviour was the extravagant bet that he would have the battery facility up and running within one hundred days of the contracts being signed or, he solemnly promised, it would be free. Other companies who tender for projects and then sign contracts for fixed-price projects within a required time do so quietly as a matter of course and don’t feel the need to shout about bets and gambles. They know what their contract requires and they do it or suffer penalties – just like Mr Musk’s contractual obligation. 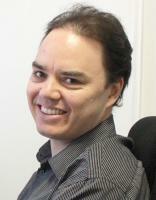 But the “bet” was good PR and everybody – including the South Australian Government lapped it up. And guess what? Mr Musk won his bet. What a surprise! However, when very hot weather struck southern Australia in January, the battery facility proved to be seriously wanting. On the two January days of highest temperatures, the wind was blowing so little in South Australia that it was only producing about 6.5 per cent of its capacity. South Australia was relying on Victoria for 31 per cent of its power, 23 per cent of which was provided by hydro-electricity. According an Institute of Public Affairs analysis, wind contributed only 3.5 per cent of national energy generation on the second day of highest temperatures. The South Australian Government has refused to say what this battery facility cost although it is generally accepted to be at least $50 million. The mere matter of taxpayers’ money is nothing compared to what Premier Weatherill calls “history in the making”. And I say it is a lot of poop. I don't use rude words very often but sometimes the opportunity is too tempting. Lake Poopo really is called that. It is a lake in South America that lacks water at the moment and Warmists like to say the water has all gone away because of global warming. So the NYT has up a big picture of the dry lake bed. But NYT readers must be mostly scientific illiterates. Given their Leftism I can believe it. It's High School science that warmer waters give off more evaporation which eventually comes back down as more rain. So any real global warming would fill Poopo up! Drought suggests global COOLING! 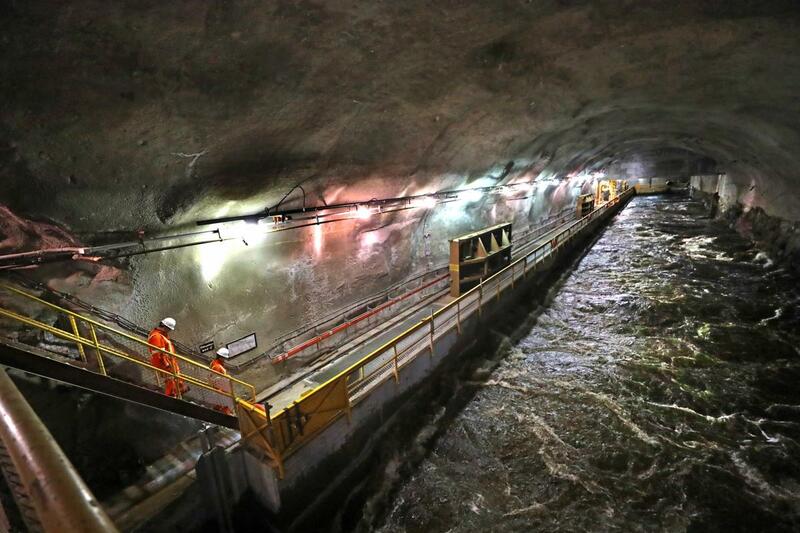 Deep beneath a granite mountain in the vast, snow-covered wilds north of the Saint Lawrence River, a frigid torrent surges through a massive, man-made tunnel, its white water propelling eight powerful turbines that generate electricity for hundreds of thousands of people. Within two years, a significant amount of that power, along with hydroelectricity from other plants in this Canadian province, could be exported to Massachusetts, providing the state with a long-awaited influx of renewable energy. This week, state officials are expected to announce whether they intend to buy more hydropower as part of the Baker administration’s energy plan. But in and around this old paper mill town about 400 miles northeast of Montreal, the indigenous peoples of the region harbor major concerns about the environmental impact of the project, complicating the quest for climate-friendly power. State energy officials are considering six bids for renewable energy projects that would produce enough electricity to power about a million homes, enabling Massachusetts to reduce its carbon emissions 25 percent below 1990 levels by 2020, as required by state law. Three of those bids are for lucrative long-term contracts from Hydro-Québec, a government-owned company that generated $13.3 billion in revenue in 2016 from its immense system of 63 dams and 27 reservoirs, many of which were built amid great controversy. By some estimates, the contract with Massachusetts, which would run for 20 years, could be worth $12 billion. But those bids have thrust Massachusetts into a long-running dispute between the power company and the region’s indigenous peoples, some of whom have accused Hydro-Québec of “cultural genocide” and damaging rivers that have been vital to their economy and traditions for generations. Officials at Hydro-Québec acknowledge the concerns of the Pessamit, and after years of protests, the company’s chief executive in December welcomed Simon to his office in Montreal. The two agreed to a series of negotiations in hopes of settling the Pessamit’s longstanding claims against Hydro-Québec, which include multimillion-dollar lawsuits against the company. Company officials maintain that a deal to sell Massachusetts an additional 1,200 megawatts of power — a tiny percentage of Hydro-Québec’s overall capacity — would have little to no impact on the Pessamit. They also note that they have previously sought to accommodate the group’s concerns, both historical and environmental, by agreeing to share profits from one of their power stations on Pessamit ancestral lands, providing them with grants, and spending years trying to reduce the damage their dams inflict on salmon. “Over the past 40 years, Hydro-Québec has diligently consulted the native population for all of our production and transmission projects, including the Pessamit,” St-Laurent said. In Massachusetts, Baker administration officials declined to comment on whether they’re considering the concerns of indigenous groups in choosing a bid. The other bids include proposals by National Grid to import wind power from Québec and by Emera to build a power line beneath the ocean, from New Brunswick to Plymouth. In essence, Trump's decision continues the government's proclivity for picking winners and losers. In essence, Trump’s decision, unfortunately, continues the government’s proclivity for picking winners and losers. Furthermore, the Associated Press reports, “Sen. Ben Sasse … said Republicans need to understand that tariffs are a tax on consumers.” He’s right. There’s no doubt any of this was the administration’s intent — Trump, after all, once pledged, “We will get the bureaucracy out of the way of innovation, so we can pursue all forms of energy” — but nevertheless, the decision was made without taking these issues into account. Imposing tariffs on the solar industry wasn’t one of Trump’s brightest decisions. World leaders are worried that a massive blizzard could derail their opportunity to talk about solutions to global warming at a major economic conference in Switzerland. Snowflakes are canvassing Davos in nearly six feet of snow. Snow kept pounding the valleys and areas surrounding the town Monday night, causing plutocrats, members of the media, and world business leaders to slip and slide on their way to various conferences at this year’s World Economic Forum. Some participants say it’s the worst snow storm they’ve seen at the conference in years. “I’ve been coming for eight years and this is the worst I’ve seen it,” Linda P. Fried, the dean of Columbia University’s Mailman School of Public Health, told The New York Times. She dismissed critics who mock the incongruity of talking climate change during a giant snowstorm. “It isn’t accurate, people just don’t understand, that’s not the metric” said Fried, who was late to a discussion on climate change, despite having etched out three hours for travel from her hotel to the conference hall. Journalists who were late to interviews at the conference tweeted out photos of the enormous snowbanks blocking their travels. Organizers are hoping the snowy conditions loosen up by the time President Donald Trump arrives on Friday to give the closing address. Things could dicey if snow continues apace, especially if the president decides to use helicopters to land in Davos. A bulletin from the SLF Institute for Snow and Avalanche Research in Davos, which calculates the possibility of avalanches, showed a broad band of the mountainous country under Level 5 avalanche danger, the highest on a 1-5 scale. The [British] government’s 25-year environment plan is more than a piece of virtue signalling, despite its chief purpose being to persuade the young to vote Conservati(ve)onist. It is full of sensible, apolitical goals and in places actually conveys a love of the natural world, which is not always the case with such documents. Take the agri-environment schemes under which farmers are rewarded for doing things that, say, make yellowhammers [a bird] happy. Most agree, and this plan notes this, that under the European Union’s Common Agricultural Policy (CAP) the schemes have been wasteful, spending fortunes on things that work poorly and too little on things that work well. Talk to smaller research organisations such as the Game & Wildlife Conservation Trust and you will find that they have learnt through experimentation how to stop yellowhammers starving at the end of the winter (non-dehiscent plants that don’t shed all their seeds too early). It is the same with wild flowers, woodland and clean water. Good practice spreads by word of mouth in the countryside after practical people discover it through trial and error. The rewilding of the Knepp estate in West Sussex by Sir Charles Burrell, for example, has shown that nightingales are attracted to breed in unkempt thorn hedges.